Are you sure your are measuring your body composition accurately? Body composition is a measurement that is reflective of your health and exercise status. This week we are going to be discussing some of the amazing new technologies that allow us to know more precisely and specifically what is going on within your body. This data allows us to more nearly tailor treatments to your specific goals and needs. Beginning with the belief that replacing your lost testosterone will underpin your basic muscular strength so that you can work on a program to diet and exercise your way to good health as you age, we can use this equipment to follow and fine tune your treatment plan and its progress. The machine we will discuss this week is the InBody machine. It is in each of our offices and free of charge for BioBalance Health patients. Total Body Water—our bodies are mostly water, and the amount of hydration can make a big difference in our weight. 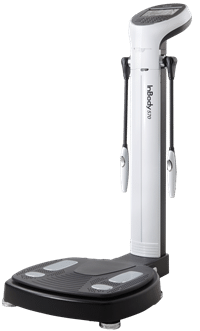 The InBody machine measures all the water that is contained inside your cells (Intracellular Water) and the water that is in your blood and lymph system plus swelling you might have in your subcutaneous tissues (Extracellular Water). Total Body Water Ratio (ECW/TBW) is calculated by dividing the water that is not in your cells, and divide it by all the water in your body. You are given a score that tells you if you are dehydrated (low ratio) or swollen (high ratio). Dry Lean Mass—includes the amount of muscle, bone, and everything in your body other than fat and water. In short it measures the tissues made of protein and minerals. Low Result: If you do not exercise, don’t eat enough protein, if you have osteoporosis, or if your muscle mass is shrinking because of aging without T replacement. High result: This is a good sign of plenty of muscle, thick bones, and good protein nutrition. This increases quickly when older patients take T pellets. Body Fat Mass: is the total fat in your body, including fat in your cells, brain, subcutaneous fat, and abdominal fat mass. We want this number to be in the normal range for height and weight. Some of us carry fat in our abdomen, others in our thighs or hips, even breast fat is part of Body Fat Mass. When I look at the changes in this number between visits, I can tell if your diet is good or if you are fudging about what you eat. Body fat that does not decrease with T Pellet therapy indicates a high carb diet, inactivity, slow metabolism, or other hormone deficiencies. You can change the first two and I use medication to change the metabolism. Weight is just a measure of gravitational pull on your body. It indicates a gross number that includes all of the above parts of our body. Doctors use weight and height to calculate the BMI, because weight is easy and cheap to measure, not because it is the most accurate way of measuring if a person is “over-weight”. BMIs are of little use for determining if your lean body mass is healthy because if you have thick bones or a lot of muscle your number will be high for your height. If you are healthy with a lot of muscle the BMI will be artificially high and therefor misleading. Weighing in at each doctor’s visit is the simplest way to find out if you are gaining fat, but is still a crude measure of health. At BioBalance® Health we do serial body composition measurements to find out exactly how your body is changing under the influence of testosterone pellets or our medical diet program. The InBody analysis is free to BioBalance Health patients because as it is a valuable measurement to track our patient’s progress.